Known only as 'the goalie', the novel's narrator is always taking the blame. He's just been released from jail, having kept schtum during a drugs bust. The goalie is a sucker for a good story, he lives and breathes them, is forever telling stories to himself and anyone who'll listen. He returns to his hometown broke, falling in love with Regi, a barmaid. On a trip together to Spain Regi realises that this obsession with storytelling has its downsides, the goalie all too ready to believe the yarns his so-called friends spin. 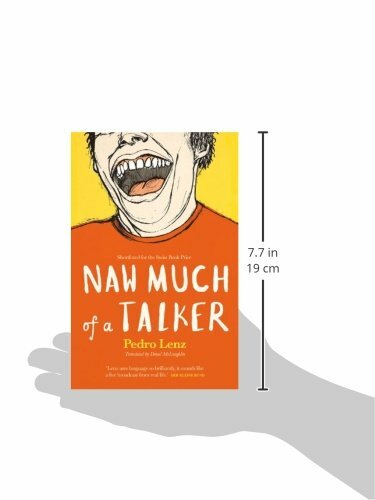 Naw Much of a Talker is a charming, hilarious tour through the goalie's anecdotes. Storytelling is his way of avoiding problems and conflict, his crowning achievement and tragic flaw. Regi concludes that it isn't a woman the goalie needs, but an audience. Inspired by a six month residency in Glasgow, Pedro Lenz harnesses his considerable powers as a performer and oral storyteller in this powerful and unforgettable celebration of the rhythms and musicality of the spoken word.